This Training Program is designed to prepare athletes to summit Mt. Rainier via the Disappointment Cleaver Route – the most traveled route to the summit. This program is designed to prepare athletes for the rigors of a two day summit push to Rainier from Paradise to Camp Muir and subsequently the summit and down to Paradise. Strengthen your “ Mountain Chassis” – legs and core – for the miles and thousands of vertical feet you will be climbing up and down during your Rainier summit bid. Build your “Mountain Endurance” for climb. This includes uphill hiking under load, rucking/hiking over hilly terrain, and overall running endurance. Increase your durability – especially ankle/knee/hip integrity and mid-section strength. Increase your mental fitness for the mental demands of the summit bid. A Rainier summit via the Disappointment Cleaver Route usually takes two days. The first day includes 4.5 mile hike from Paradise to Camp Muir with a 35 pound pack and an elevation gain of 4,660 feet. Summit Day involves climbing from Camp Muir to the Summit and then down to Paradise and can take between 10-14 hours. This involves about 4,500 ft of elevation gain and 9,000 ft of elevation loss. The total trip length involves covering roughly 18 miles between the two days with some variation on routes or if you encounter any additional obstacles. This is a progressive, very intense, 7-week week training program which will demand a high level of commitment in both time and effort. You will train 6 days/week for 7 weeks for a total of 42 sessions. Because of the volume involved, the program’s trainings sessions can be long in length. As well, you will be conducting two-a-days Monday, Tuesday, and Thursday during this program. The volume, intensity and progression of this program reflects the physical demands of your Rainier climb. We don’t want you to merely “survive” the climb, but be strong throughout and truly savor and enjoy the experience. Below are a few of the primary exercises you’ll complete during this training cycle. Step Ups – Step Ups are a proven, sport-specific method of training uphill hiking under load and are the primary mode this plan deploys to train you for the loaded, uphill hiking you’ll do summiting Rainier. We first developed these to train US servicemen for deployment to mountainous regions of Afghanistan. This plan will have you doing thousands of step ups, starting with 1,000 out of the gate. Use a 16-18 inch bench or box for your step up height. Step ups are very effective, but can also be pure drudgery. Good music, book on tape, etc. will help the time go by. As well, a hand held counter will greatly improve your counting. Alternatively, you can simply climb a steep hill, flights of stairs, stadium steps, etc. for the vertical feet equivalent. You’ll want something very steep to be efficient with your time. Leg Blasters – A simple, but intense, lower body bodyweight exercise complex which has proven to be very effective at training eccentric leg strength. Step ups will train you for the uphill. Leg blasters will train you for the downhill – which is actually much more intense from a muscular perspective. Rucking and Trail Running – Rucking or Hiking over hilly terrain at a moderate pace will simply build mode specific endurance for your climb. Most of the running you’ll complete in this plan will be at an “easy” pace – designed to simply increase your aerobic base. Don’t be fooled by these simple rapid movement and hold intervals. We’ve found these to be very intense, but effective at strengthening your calves for uphill climbing. Each training session has a listed training objective. The sessions will start around 60-90 minutes and progress to upwards of 3 hours at the top end of the progression. The Mountain Endurance work – step ups/vertical hiking, Ruck/Hiking, and running will take the most time. If for any reason you cannot keep training schedule, do not skip a training session. Rather, complete all the training sessions in succession. Whatever the schedule, always take at least one day a week as a total rest day. For this plan, Training Sessions 1, 7, 13, 19, 25, 31 and 37 are Mondays. Bench or Box for step ups. 16-18” high. What does “3/5x Pull Ups” Mean? What does “40/60# Sandbag” mean? The lower number is for women. “3/5x Pull Ups” = women do 3x pull ups, men do 5x pull ups. “40/60# Sandbag” = Women use a 40# Sandbag, Men use a 60# bag. Where do I find the “Running Calculator” for trail runs? You can also find this link on the drop down after clicking our “Exercises” tab on the website homepage. However, for the long step up sessions and long Saturday rucks, we recommend you supplement ever 45-60 minutes with an energy gel or chews. 'Sitting here in the airport waiting to head back to NYC. I just wanted to say thank you. I used your plan to train for a climb on Mt. Rainier. While we did not summit due to conditions on our route, we made it to the top of disappointment cleaver just over 12,000 ft. Even though we did not touch the top. Not once did I feel like my physical ability would keep me from getting there. People were taken aback by the volume of step ups I was doing. They paid off both physically and mentally! I look forward to using that plan to train for my next attempt at it. 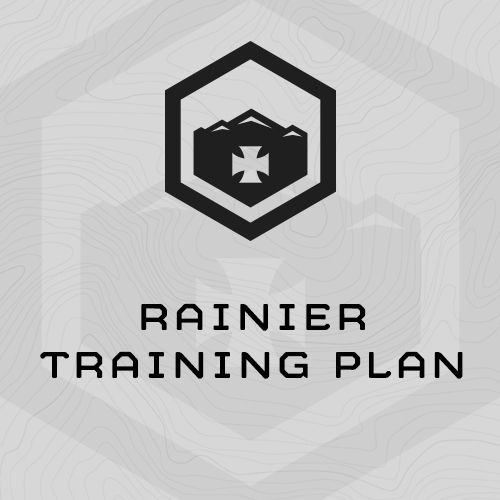 "Thank you for your amazing Rainier Training Plan. I used it leading up to an attempt on Rainier’s Liberty Ridge. While we didn’t summit because of bad weather, I felt extremely strong and fit during the climb. The training plan did a great job of focusing on every aspect of fitness that one would need on the mountain. My 35 pound back weight didn’t even phase me. I was especially surprised and enjoyed the sandbag getups, the first few weeks they were murder, but by the end of the program I was just cranking through them. I did find the amount of time required to be excessive, and had to add in an extra rest day each week to catch up on my “adult” responsibilities, but I’m sure other people will be able to manage. Thanks again!"